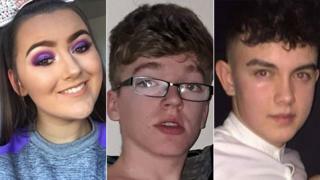 The initial police response to the incident at a County Tyrone hotel in which three teenagers died is to be investigated by the Police Ombudsman. It has been revealed that the first officers who arrived at the scene of the tragedy withdrew to await support. Morgan Barnard, 17, Lauren Bullock, 17, and Connor Currie, 16, died after a crush at the Greenvale Hotel in Cookstown on 17 March. The first police officers arrived at the hotel grounds shortly after receiving a 999 call. "Following their initial assessment they made attempts to establish more detail and information about what was happening and subsequently withdrew to await further police support," said Deputy Chief Constable Stephen Martin. "When the first ambulance arrived police moved forward in support of them. "The confidence of the families and the confidence of the communities we serve are at the forefront of our minds in our decision to refer this matter to the Police Ombudsman," Dep Ch Con Martin said. The Police Ombudsman has appealed for witnesses to contact them via email at witnessappeal@policeombudsman.org.